My friends have a nice raised deck on the rear of their house but were never happy with the railings and balusters that the contractor installed. The top rail was a 5/4 x 6 pressure-treated board which sagged in the middle of each span. The railings were the same material, turned on edge and nailed to the posts with pressure-treated faux turned balusters screwed on the faces instead of mounted between a bottom and top rail as they are meant to be. 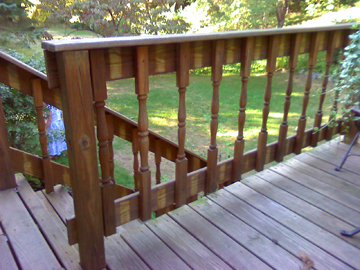 The owner had attempted to open up the view by removing every other baluster, which put the deck out of compliance with code. She asked me to create a railing system that would be less bulky and more open. I removed everything except the pressure-treated posts, which I power washed along with the deck, and then treated all surfaces with a solid dark cedar stain. I find that solid stains work best for preserving wood and protecting it from solar oxidation. I built new top and bottom railings in my shop and then installed ¾” x 30″ round black balusters attached to internal hidden baluster connectors in the railings, spaced 4 ¾” on center. After all the units were complete, I installed them at the client’s location. Everything was a perfect fit!